You have already decided on the number of guests and the venue for the wedding party, approved the festive menu and decorate the hall? Go to the next stage of the preparation of the wedding celebration: choose the scheme of arrangement of tables and seating guests. Options for the location of the wedding table there are so many, which one will be best for you, depends on the number of invitees, and on individual tastes. If you are planning a wedding in the circle of the closest,It will be the most convenient arrangement of wedding tables in the shape of the letter "T". At the end of the table should put the bride and groom, as well as witnesses and parents. The guests will sit facing each other, which is ideal for familiar people. If the wedding is going to be noisy, andinvited so many that they are hard to even remember the names, try to arrange the wedding tables by the letter "W". At the center of such a complex shape is placed young, parents and witnesses. For the average number of guestsPossibly suitable placement optionWedding tables in the shape of the letter "P". At the head of the table, of course, the couple, the parents and witnesses. Particularly well this figure will approach, if invited by the groom and the bride about the same. If the number of places will allow, it is better to put the guests facing each other: in this environment, unfamiliar people will be easier to communicate. If many guests are expected, and the room wherewill be held a wedding banquet, small, you can put wedding tables with the letter "G". In this case, the young, the parents and witnesses can be placed anywhere, as long as they were in one place and to be seen all invited. 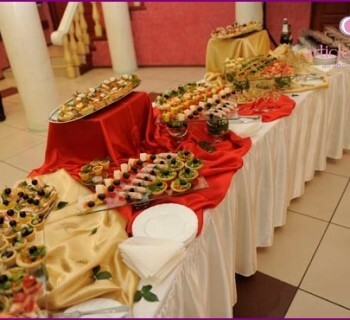 For those who are planning a wedding in the form of a buffet, the best would be American variant of arrangement of wedding tables. Meals festive menu are put on long,standing near the wall parallel to each other tables. 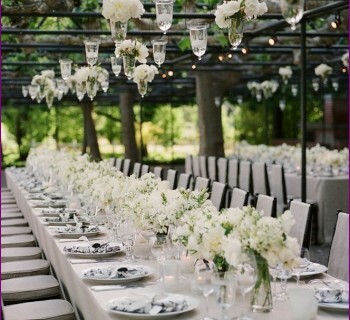 The guests move freely between these wedding table with plates, imposing themselves what they wish. English version arrangement involves a separate table for the wedding of the young. Invited eight people seated around small tables. A separate table is provided for young and Italian versionOnly in this case, the bride and groom is a small podium. Guests are accommodated four people standing around in a semicircle behind the podium wedding table. Whatever wedding table placement option you choose, it is necessary to take care ofSpecial cards with the names of guests, which are put on the plate in order to avoid confusion with the seating. By the way, meeting and accommodation of invited young parents involved, but not the bride and groom. next to the young is the groom's father and the witness, next to the young - Mother of the Bride and the witness, the bride's father and mother of the groom sit in front of the newlyweds. In any case, should not be invited to offend the elderly and plant away from the bride and groom. They will be very pleasant to sit closer to the young. 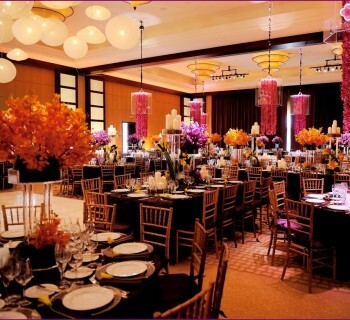 How to decorate tables at the wedding reception?